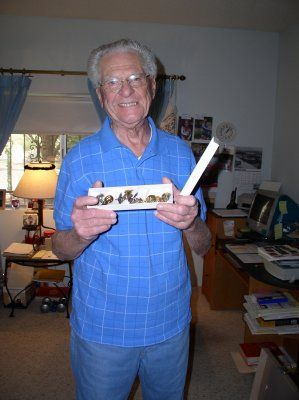 Ralph Hoffman's crew came to the 458th in mid-November 1944, and was assigned to the 753rd Squadron. 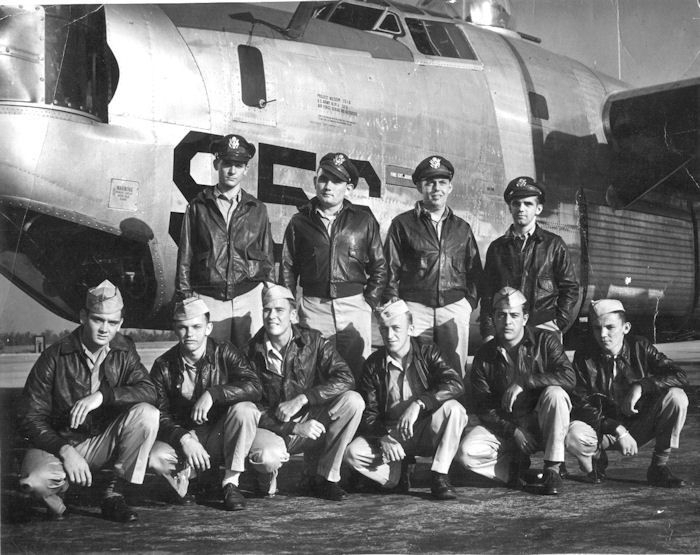 Their bombardier, F/O Bledsoe, was not assigned to the Group with the crew. 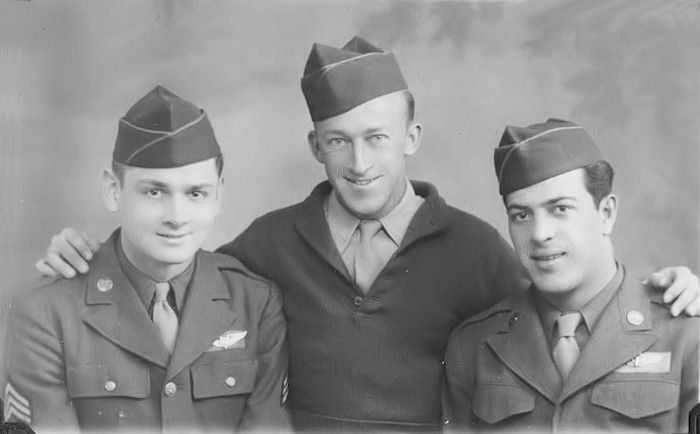 After the obligatory indoctrination period into the theater, they began their combat career on December 6th 1944 with a mission to Bielefeld, Germany. 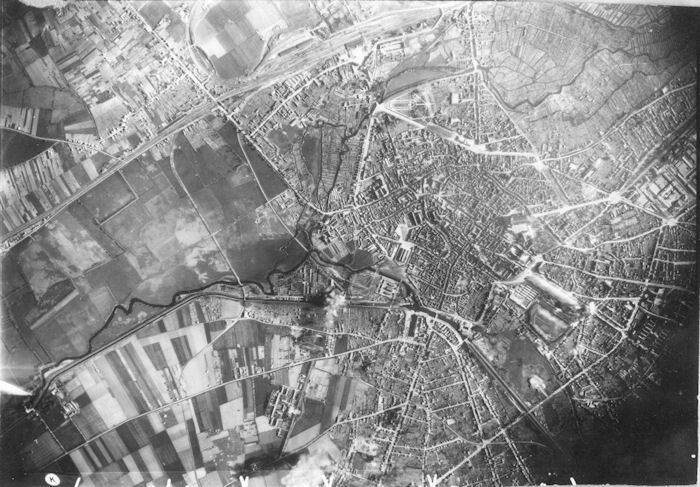 Missions to targets in the German towns of Koblenz, Neuwid, and Remagen followed. 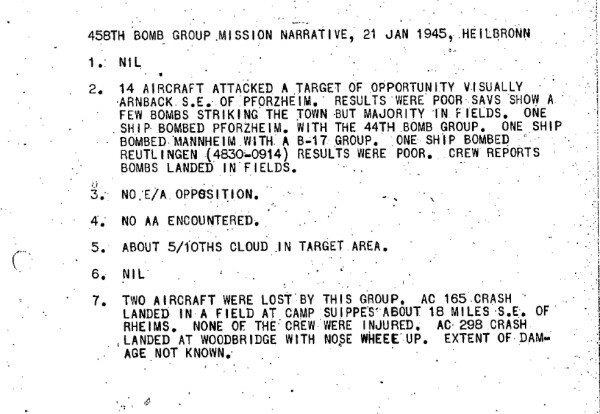 On January 17, 1945 the 458th was briefed for a mission to bomb the oil refinery in Harburg. Unknown to navigators of the group their flight path took them directly into what later became known as the jet stream. Tail winds of 200knots were encountered giving the bombers almost a 400knot ground speed. According to navigator Bill Coleman, "the bombardier had to scramble like mad to get the bomb sight set up, but in about three minutes the bomb bays were open and the bombs went away." 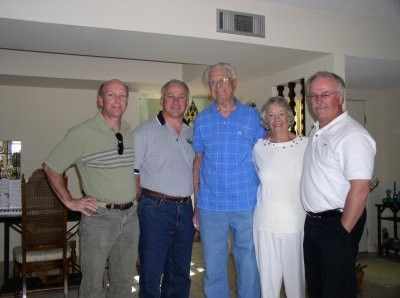 Realizing that their return flight would be against a headwind of 200 knots effectively making their ground speed zero, Hoffman led the flight in a diving turn, changing altitude and they made their way home. Four days after this mission, on January 21st, the crew was briefed to hit the marshalling yards at Heilbronn, Germany, but heavy contrails from the lead group over the target obscured vision and necessitated a drop on a target of opportunity. 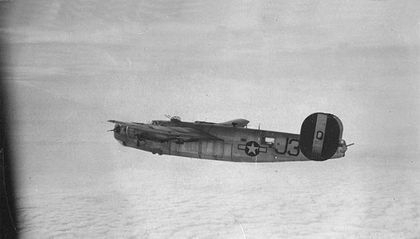 Hit by flak in the target area, which damaged their fuel system, the crew ran out of gas near Rhiems, France and Hoffman put their B-24 down in a field. The ground was hard and the plane hit a furrow which drove the nose gear into the navigation compartment. 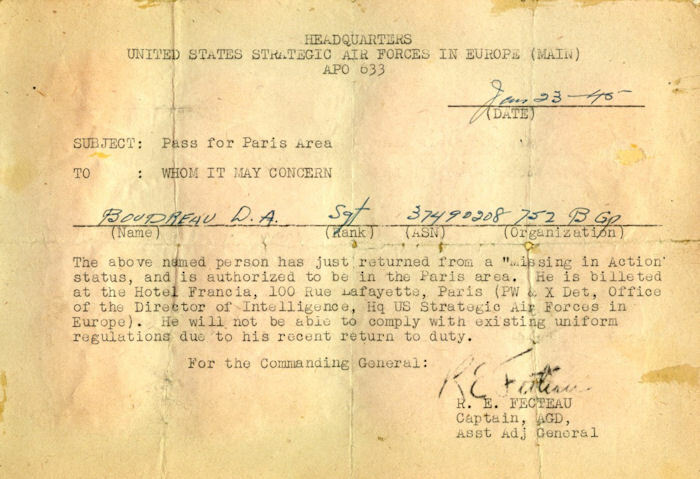 Most of the crew decided to stay with the plane while Coleman and Sgt McWeeney, the nose gunner walked to a nearby Allied headquarters, about 15 kilometers away. 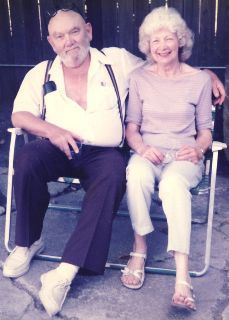 As Coleman and McWeeney were entering the compound, a truck passed them carrying the rest of the crew who had been picked up after the two had left. The crew were taken to Rhiems and put on an airplane to Paris. After five days in Paris, they returned to Horsham and resumed their missions. 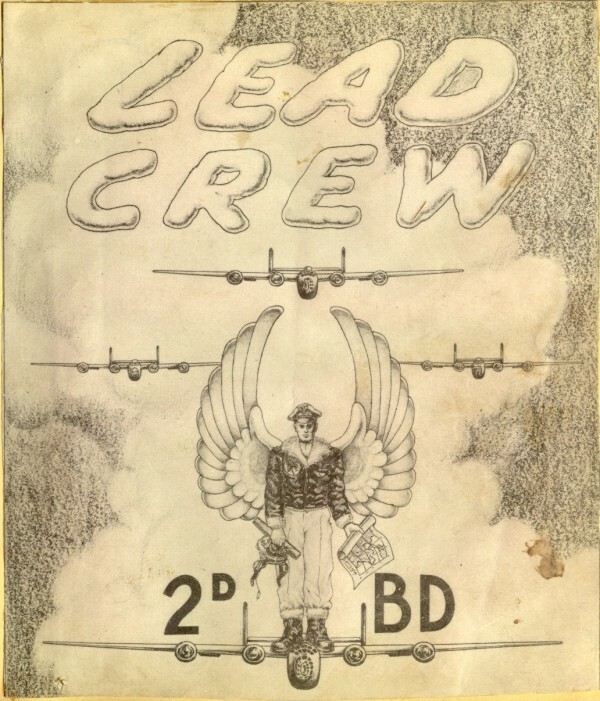 On February 21, 1945, the crew was transferred to the 755th Squadron to be a lead crew. 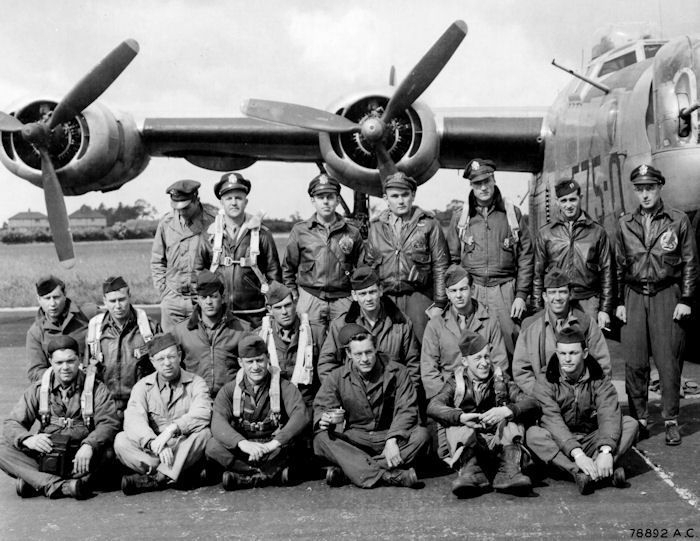 They flew a number of squadron and group leads between February 21st and the end of the war. 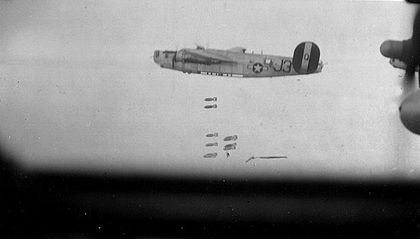 On the last mission flown by the Eighth Air Force on April 25, 1945 to Bad Reichenhall, Hoffman led the third section over the target. 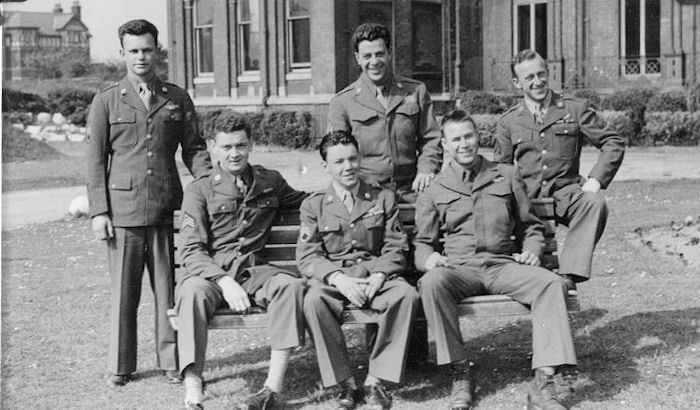 F/O Bledsoe, the bombardier who trained with the crew was not assigned with them to the 458th. His status is unknown. 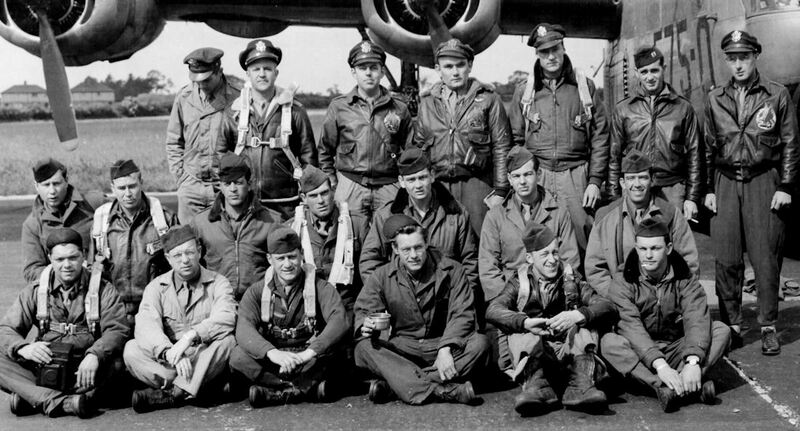 When the crew was transferred to the 755th Squadron, three additional crew members were added to the nose section. It is assumed that these three flew most, if not all of the lead missions with Hoffman's crew. 2Lt Thomas E. Walsh, navigator, was assigned on November 18, 1944 with 2Lt William G. Everett's crew. 2Lt Lawrence B. Timmons was a third navigator assigned on November 9, 1944 on the crew of 2Lt William C. Spratt. 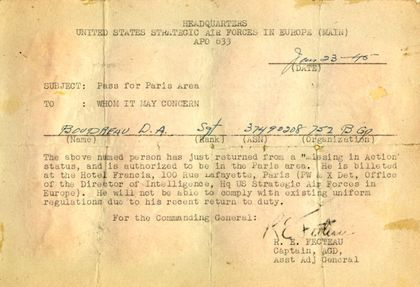 The third member was F/O Walter W. Godsin, bombardier, also assigned on November 18, 1944 on 2Lt Donald G. Williams' crew. 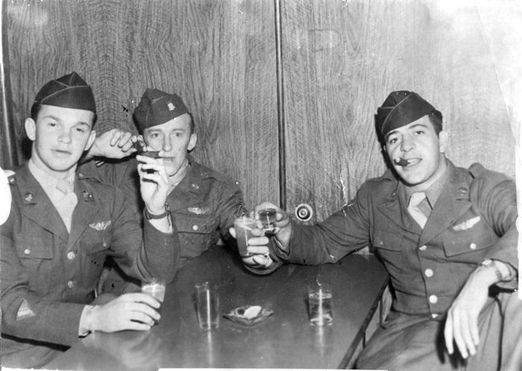 Group records show the crew going to a Rest Home on April 30, 1945, their combat flying completed.